Do you feel disconnected from the world outside of your door? The parts with grass, trees, breezes, dirt, and well, life? 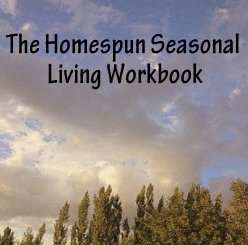 The Homespun Seasonal Living Workbook was created to reconnect you to the patterns of Seasonal Living. Katie gives you 12 short, weekly lessons designed to help you get in touch with the seasons as they present themselves to you in your part of the world and help you achieve your own homespun seasonal living goals. When I say “Seasonal Living” do you know what that means? The concept of seasonal living is easy – turn your focus towards better knowing your home, land, and ecosystem better by paying attention and following the changes that happen as the year goes by. This encompasses other things, like eating seasonally, knowing what flowers or fruits in June versus August, and being able to identify the plants and animals that live with you in your little corner of the world. Kathie Lapcevic (HomespunSeasonalLiving.com) has made it easy to immerse yourself in the practice of awareness with the Homespun Seasonal Living: 12 Week Workbook. The methods that she shares in her book are gentle and effective, but they don’t demand too much, or take a lot of time out of your day to complete! Each lesson and its exercises are one week long. From acknowledging your own seasonal patterns, you will gain an awareness of what to expect in the following year, and each year onwards. Stop living at the whim of the rushing mass of humanity around you, take a few deep breaths, and find your peace, your place in the larger cycles of nature. Kathie has self-published this workbook and if you wish to get a copy, you can buy a copy from HomespunSeasonalLiving.com. If you buy the book between June 14-20, 2014, you’ll get it for 50% off!